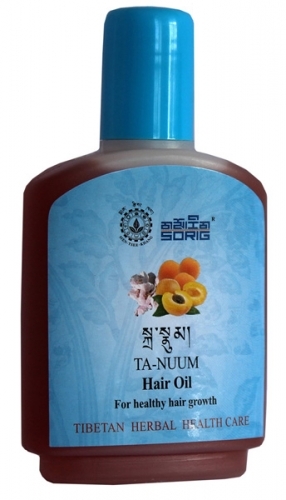 This is a traditional and entirely natural Hair Oil that has been formulated according to ancient Tibetan medical texts to promote hair growth, control hair loss and dandruff as well as help the energy flow for an overall sense of calmness and well-being. Apricot kernel oil promotes hair growth and massaged into the scalp it ensures the health of the hair and scalp. Emblica officinalis (also known as amla) contained in this oil strengthens and promotes hair growth as well as preventing premature greying and dandruff. Amla is traditionally known to strengthen and rejuvenate hair that is dry and damaged as well as helping to balance Loong, Tripa and Baeken, the three principal humours.